Dark Circles Contemporary Dance explores movement through text in Italian choreographer Fabio Liberti’s Here Is Not There, part of the company’s Spring Series in Fort Worth. The text-driven work features six dancers (DCCD Company Members David Cross, Chadi El-Khoury, Alex Karigan Farrior, Sarah Hammonds, Artistic Director Joshua L. Peugh and Kelsey Rohr) and includes minimal music by Marguerite Monnot and Nancy Sinatra. Liberti’s Here Is Not There will premiere at DCCD’s annual Spring Series, April 29-May 1, at the Erma Lowe Hall Studio Theatre on the Texas Christian University Campus in Fort Worth. The program also includes Peugh’s prom-inspired version of Igor Stravinsky’s Rite of Spring which the company premiered at Dallas City Performance Hall in March. Since graduating the Codarts-Rotterdam Dance Academy in Italy, Liberti has performed professionally with Conny Hanssen Danst in Holland, Stadttheater Hildesheim in Germany, Stadttheater Saint Gallen in Switzerland, AIEP-Ariella Vidach in Italy and most recently with Danish Dance Theatre in Denmark. He received third place at the Copenhagen International Choreography competition in 2013 and received the Critics’ Award at the Hannover International Choreography competition in Germany. It was at the Hannover competition where Liberti meet Peugh backstage and their artistic friendship only blossomed from there. Watching DCCD rehearse Liberti’s Here Is Not There at Southern Methodist University back in January, it was easy to see what drew these two curious minds to one another. Liberti and Peugh both have similar movement tendencies such as expansive gesturing, heavy tailbone traveling steps and the use of unlikely body parts like the stomach or elbow to connect with one another, as well as a knack for finding humor in even the most intense situations. Authenticity also plays an important role in both choreographers’ creative processes. “I am always searching for authenticity in my movement,” Liberti says. “So, I add in what I like, but I also keep in the personality of the person I am working with and what feels good to them when it comes to the choreography.” In Here Is Not There, Liberti accomplishes this feat by assigning each dancer a composition task to which he later adds more layers too himself. He also sent out a questionnaire to the dancers prior to arriving in Dallas which Liberti used as the foundation for the text in the work. The responses, which Liberti says could be answered truthfully or not, became poignant monologues reflecting on specific moments and memories from each dancer’s past and present. While the idea of combining movement and spoken word is not uncommon in the modern dance world, this is the first time DCCD is exploring this particular avenue. When asked about the challenges of moving and talking at the same time company member Hammonds says, “It was definitely a learning experience as I am not the best at memorizing text. Kelsey and I spent a lot of time working on the text we have to say together. We had to sit down and break down which words we were going to emphasize and which ones we weren’t.” The section Hammonds is referring to is what the group calls the twin section where Hammonds and Rohr reflect on the various questions twins get asked such as do you finish each other sentences and do you even like each other in a sing song cadence while Cross and El-Khoury slink, roll and army crawl across the floor decked out in matching striped tops. “The challenge for us was to execute the phrasing without thinking about what is coming next while also keeping pace with the text, but not relying on it for movement cues,” Cross says. >>This preview was originally posted on TheaterJones.com. >>Also check out my preview of Josh Peugh’s Rite of Spring. 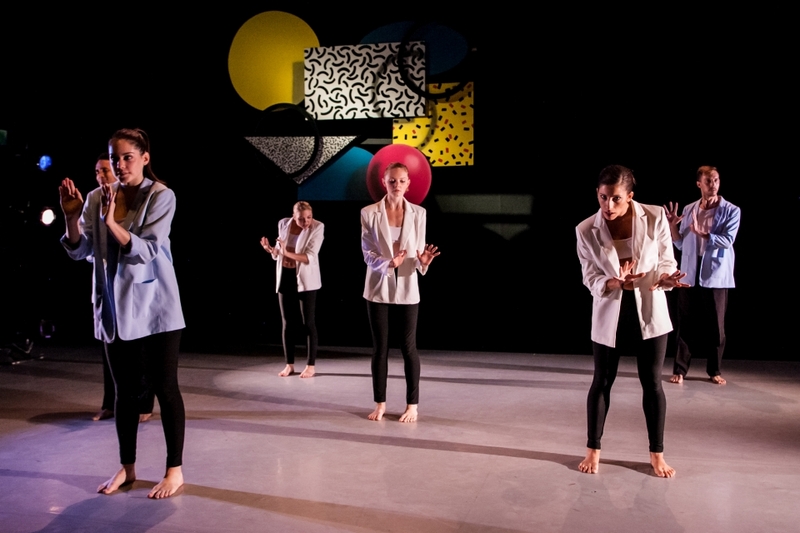 In its second-season opener, Dark Circles Contemporary Dance showcases its expanded movement vocabulary and comedic flair in three very different premieres. Fort Worth — Anyone who has seen Joshua L. Peugh’s work knows that he is not the type of choreographer that takes himself too seriously. And thank goodness for that, for Peugh’s topsy-turvy choreography and unique sense of humor has been a most welcomed addition to the North Texas dance scene. A fact that was reinforced this past weekend with three packed performances of Dark Circles Contemporary Dance’s second season opener,Beautiful Knuckleheads, at the Sanders Theatre at the Fort Worth Community Arts Center that led the company to add an additional fourth show on Saturday afternoon. Esperanza also embraced the bareness of the performance space by having the dancers slide up and down the stage left wall while performing a series of isolated body movements reminiscent of those seen in a nightclub. This particular section was a testament to how an individual’s energy, while not necessarily pretty in this case, can still be mesmerizing. The opposite is also true which was beautifully showcased by Dexter Green and Steffani Lopez as they melted into each other’s arms and began slow dancing near the end of the number. This show was a defining moment for Dark Circles Contemporary Dance. The company has accomplished in one season what many established North Texas companies have been trying to do for years, and that is reaching a younger audience base. This can be attributed to DCCD’s strong presence on social media and young group of dancers, but it’s more likely due to Peugh’s eccentric personality and fresh ideas that just naturally appeal to a younger crowd. The biggest challenge for the company moving forward is going to be finding a larger venue for its future performances.